My favorite turkey burgers recipe! Thanks to our secret ingredient, these burgers are loaded with flavor and won’t dry out. Jump to the Homemade Turkey Burgers Recipe or watch our quick recipe video showing you how we make them. 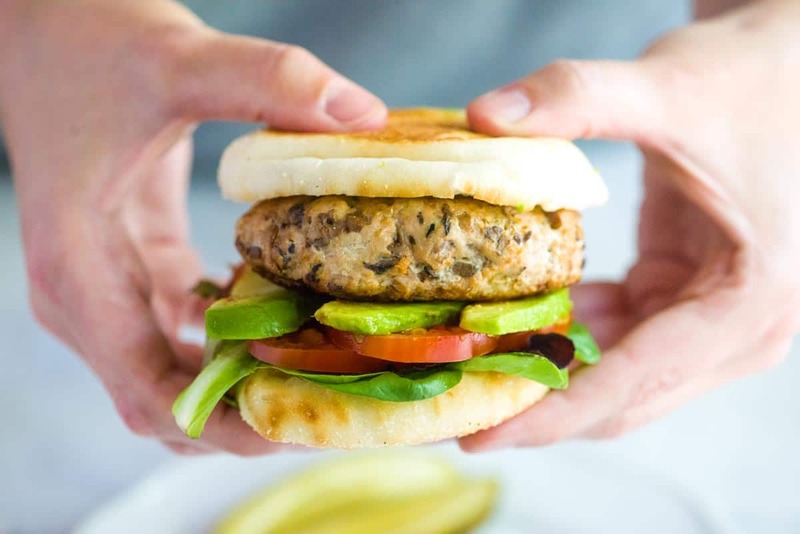 These turkey burgers are extra easy to make. We’re only talking 6 ingredients and about 30 minutes. Let’s do this! The secret to the best turkey burgers is to add mushrooms! These burgers are made with lean ground turkey, which means they are healthy, but it doesn’t help with keeping the burgers moist and juicy. Mushrooms are the best way to guarantee juicy burgers. Not only that, but mushrooms are loaded with umami — a savory, meaty flavor. So by adding mushrooms to the burgers, we guarantee that they are juicy and that they taste amazing. If you aren’t a mushroom lover, you should know that you won’t actually taste mushrooms. Instead you’ll find that the burgers take on a savory, meaty flavor. Ground turkey is the base for these easy burgers. For the juiciest burgers, I prefer to use 93% ground turkey, which will have a combination of dark and breast meat, but I have made these burgers with leaner turkey with success. Mushrooms are the key to keeping our turkey burger moist and flavorful. Most varieties of mushrooms will work, but I usually use baby bella or cremini mushrooms. Garlic and ketchup adds a little extra flavor to the burgers. 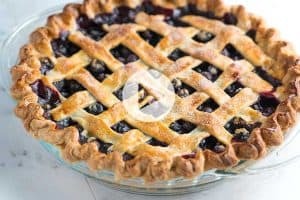 I know it might seem odd to add ketchup, but it is loaded with lots of flavor — it’s sweet, vinegary and adds a bit of color. 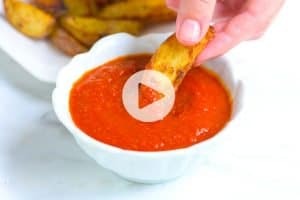 When I have it in the fridge, I love using this homemade ketchup. Fish sauce or Worcestershire sauce are what I like to call flavor enhancers. I use them a lot in our recipes. They add a savory pop of flavor. Step 1: Chop and cook the mushrooms. Here’s where most of your prep time comes in. We want the mushrooms to be chopped really small so they disappear into the ground turkey. I chop them by hand, but a food processor makes very quick work of them. When they are chopped, I cook them in a skillet with some olive oil, salt, and pepper. After 8 to 10 minutes the mushrooms will have released excess moisture and shrunk considerably. Mushrooms are the key to keeping our turkey burgers moist and flavorful. Step 2: Add garlic, ketchup and a flavor enhancer to the mushrooms. Building even more flavor into the burger mixture, I add garlic, ketchup and either fish sauce or Worcestershire sauce. Step 3: Combine the mushrooms and ground turkey. When the mushroom mixture has cooled off a bit, I gently mix it into the ground turkey meat. Step 4: Form burger patties. Our turkey burger recipe makes four generous patties. I’ve even turned these into mini burgers. Optional Step: Before forming patties, check the seasoning. To check the seasoning of the burger mixture, throw about a tablespoon of the mixture into a hot pan and cook through. Taste the mini patty then determine whether or not the burgers need a little more salt. If they do, form the patties then lightly sprinkle some salt on both sides before cooking. To cook the burgers, I heat a little olive oil in a non-stick skillet over medium heat. When it is hot, I place the patties down into the pan and cook for four to five minutes on each side or until they are cooked through. We’ve enjoyed these so many different ways. My favorite is on top of an English muffin with lettuce, tomato, and avocado. They are also excellent without the bun and served with a salad — this tomato and mozzarella salad or this feta and cucumber salad are two of our favorites. We set out to create the Best Turkey Meatloaf Recipe. Our turkey meatloaf is full of flavor, moist in the middle, and has become a reader favorite! How to make Tender Turkey Meatballs cooked in a quick and easy tomato basil sauce. This Easy Turkey Chili makes it to the table in just less than an hour and tastes fantastic. It’s healthy, too. This Easy Taco Soup makes use of pantry staples and you can cook it a variety of ways including on the stovetop, in a slow cooker, and in a pressure cooker. 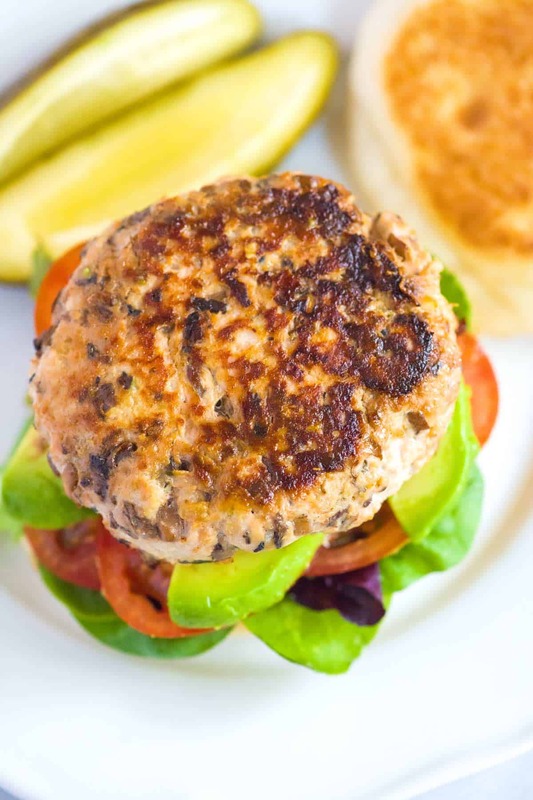 These easy healthy turkey burgers have become one of our favorite things to make. Since it’s just the two us, we make a whole batch and save two burgers for later in the week. Lean ground turkey can be a bit bland. To combat this, we call on mushrooms! By stirring cooked chopped mushrooms into the burger mixture, we add lots of umami and flavor. The magic of the mushrooms doesn’t stop there. They also help keep the turkey burgers juicy and moist. If you are not a mushroom fan, don’t worry you don’t really taste them. Instead they make the burger taste more meaty. Heat 1 tablespoon of the olive oil in a wide skillet over medium-low heat. Stir in the mushrooms, a 1/4-teaspoon of salt, and a 1/4-teaspoon of pepper. Cook until the mushrooms give off their liquid and it boils away; about 10 minutes. Stir in the garlic and cook about 1 minute or until fragrant. Remove the skillet from the heat then stir in the fish sauce (or Worcestershire sauce) and the ketchup. Set aside until warm, not hot. Gently mix the mushroom and garlic mixture into the ground turkey. The mixture might be a bit sticky. To test the seasoning, heat a pan over medium heat and add a tablespoon of the burger mixture. Cook 1 to 2 minutes, flipping once, until thoroughly cooked through. Taste the mini patty. If it seems under seasoned, you can sprinkle a little salt on the turkey burger patties just before cooking them. Form the turkey mixture into four patties (or more for smaller burgers). Work quickly and with a light touch. If you feel they need it, season lightly on both sides. Heat 1/2 tablespoon of olive oil in a wide non-stick skillet over medium heat. Add the burgers then cook 4 to 5 minutes on each side or until an internal thermometer reads 165 degrees F when inserted into the middle of a patty. Transfer to a plate and let rest, lightly covered with foil, for 5 minutes. Serve. Mushrooms: Any kind of mushroom will work here. We usually add one or more of the following: white button, cremini or baby bella, shiitake and portobello mushrooms. Food processor: To quickly chop the mushrooms or to make them extra small, use a food processor. 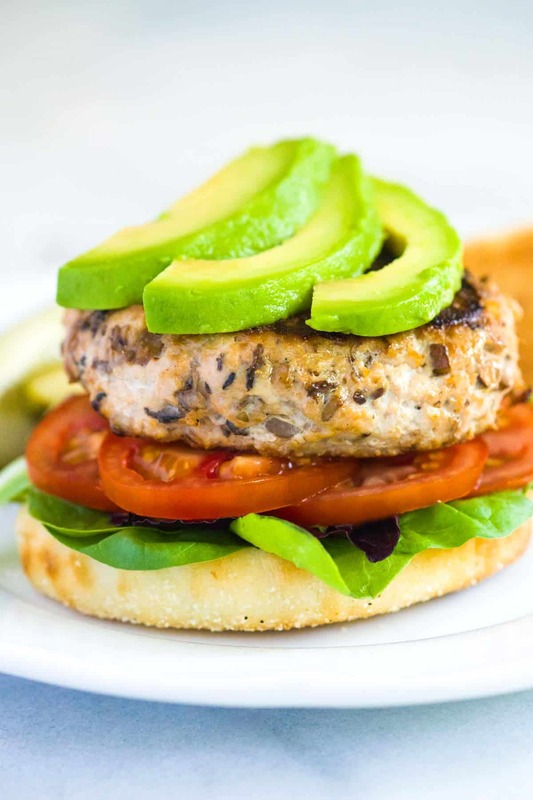 Serving: We love these turkey burgers served with salad or on top of an English muffin with sliced tomato, avocado and lettuce. Freezing the burgers for a make-ahead meal: You can freeze these uncooked and cooked. To freeze uncooked patties, prepare them as directed then individually wrap each patty. Freeze. To serve, thaw the burgers then cook as directed. To freeze cooked patties, prepare and cook them as directed then line up on a baking sheet. Slide the baking sheet into the freezer and freeze until partially frozen, about 30 minutes. Wrap them with plastic wrap (place a piece of wax paper if wrapping multiple patties together) then store in the freezer. To serve, reheat in the microwave or oven. Nutrition facts: The nutrition facts provided below are estimates. We have used the USDA database to calculate approximate values. In the calculations below we assumed 93% lean ground turkey and no bun. Just made this using the Fish sauce…absolutley fantastic and to those reviews that said it fell apart I did not have this problem I used 94% Fat free turkey. I made this tonight for the first time, and WOW! It was absolutely delicious! My husband is not a mushroom fan and he devoured two of these on multigrain sandwich thins. It’s amazing how juicy the burgers stay with the addition of the mushrooms, Worcestershire sauce, and ketchup. I added an additional clove of garlic too. We will definitely be making these again! Had to go back and comment. This recipe was unbelievable! Well done, great description and love the additional condiments to the mushrooms! Great recipes LOVED the turkey patties and meatballs and meatloaf. oops. after making these once, i decided to make them again. I realize that I didn’t read the directions well. I never cooked the mushrooms. I just mixed them raw into the turkey. Oh well, still tasted good, but really wet. The BEST turkey burgers I’ve ever eaten. I left out the fish sauce and used ketchup and Worcestershire instead. Will be making again. Two of my children despise mushrooms but gobbled these up! Thanks! I made these burgers for July 4. I have made them in the past. These were great! I was going to barbecue the burgers, but decided against it. I ended up cooking them on stove. I was going to cook them on the barbecue with a cast iron pan, but decided against it. I didn’t know how dirty my cast iron would get, meaning, soaking it and cleaning it up would be. So, instead I decided to cook them on my cast iron pan on kitchen stove. I really wanted to put them on grill, but wasn’t sure if they would stick or fall apart out there. So I chickened out and anyways, we love these burgers. I don’t eat beef. Take care, Have a Great Summer! I am looking forward to making this Seriously Good Homemade Turkey Burger, dear Joanne and Adam! Mushrooms really do add flavor to many dishes and I bet this one will, too. We are a family of food lovers and I bet this will go to our fave list of dishes in no time. Do you have a specific type of mushroom that you use or can we just mix in anything we prefer? Thank you! Hi Elizabeth, Any variety of mushroom will work, here. Hi. I love your website, I’ve tried quite a few of your recipes. I’ve made this one. But, I hesitate doing something and I have a question. Please get back as soon as you can, I might use this recipe for grilling on barbecue. What is your thoughts if I grill vs cooking in pan on stove? Would it be different? Can I barbecue these burgers? Hi Bonnie, You can cook these on the grill, but there is more risk of the burgers falling apart or sticking to the grates. To avoid the risk, we like to place a cast iron pan onto the grill grates and cook the burgers in the pan. Do you think you would be able to grill these outside? Or would they fall apart? Hi Antoinette, While I have not grilled these burgers myself, I do think they would hold up. I’ve made these several times. I love them!! I don’t know if it was the type of ground turkey we used, but the burgers fell apart. We used Jennie’s turkey and the flavor is good, but maybe a binder in it would help. Hi Megan, I’m surprised they fell apart on you. Such a bummer! Just out of curiosity, how lean was the turkey that you used? We prefer goin with 93% or close to it since there is a bit more fat in the mixture. Probably the best homemade burgers I’ve ever tasted! My family literally has no idea they are not beef & my daughter who hates mushrooms is clueless that they are in these burgers! Don’t skip the fish sauce – adds so much flavor, but I promise, not a fishy taste! I want to try these burgers. But I don’t know what Unami is. Where can I buy it? Hi Ellena, Umami is a flavor you get from using the mushrooms in our recipe. It means that the burgers will taste savory and ultra-satisfying. Great! Will be making again!! Over all, these were yummy. I noticed that you left out the sodium content (per serving) in the Nutritional Info. Since I’m definitely not with the present Avocado craze, I left it out. My lettuce of choice is Boston Lettuce, aka Butter Lettuce. Since I eliminated the avocado (which is pretty full of fat) I added a slice lower fat Swiss cheese, and served the burgers on lightly toasted whole grain English muffins. My rating is based solely upon my personal modifications. Sounds awesome. I’ve bought dry mushrooms. Could I use dry reconstituted mushrooms? P.s. you are both such nice people!!! You are too kind! 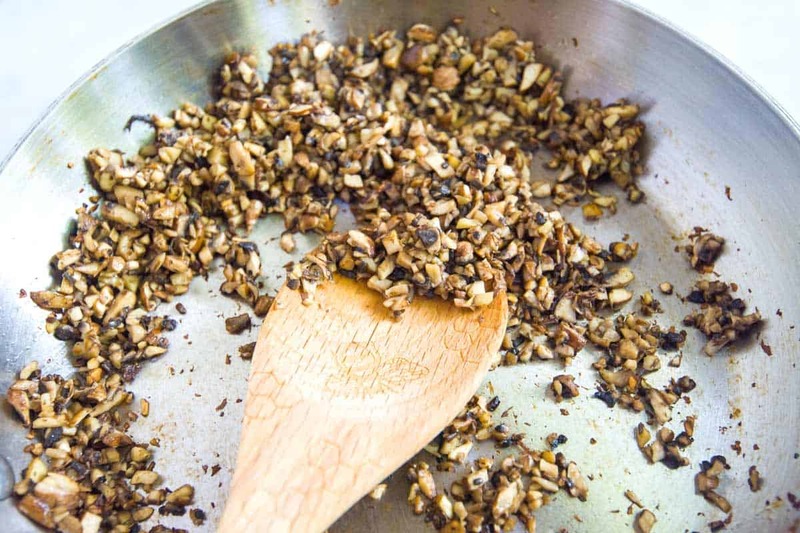 Yes, you should be able to rehydrate dried mushrooms and use them in this recipe. We haven’t personally tried it but it should work quite well. Can you give me more info about freezing these babies? I have found in the past that chicken or turkey burgers quickly become inedible (take on an “old” taste”) when they are prepared and then frozen, so my experience tells me that the best way to serve them is fresh, fresh, fresh. Am I doing something wrong? Hi Phyllis, Making sure they are well wrapped (even double wrapped) in foil could help. Here’s our method for freezing: You can freeze these uncooked and cooked. To freeze uncooked patties, prepare them as directed then individually wrap each patty. Freeze. To serve, thaw the burgers then cook as directed. To freeze cooked patties, prepare and cook them as directed then line up on a baking sheet. Slide the baking sheet into the freezer and freeze until partially frozen, about 30 minutes. Wrap them with plastic wrap (place a piece of wax paper if wrapping multiple patties together) then store in the freezer. To serve, reheat in the microwave or oven. I made these again tonight. I used 99% FF turkey. Absolutely delicious. I tagged you on my insta post and on my WW Connect post. I cook my burgers on a cast iron skillet. They are perfect! The whole family loved these even my little ones. I made them as sliders and they loved that. They were really moist with the mushroom mixture and you could not even tell they were mushrooms. I also added one egg to help keep them together more. I will make them again thank you ! I made these last night……absolutely delicious. The only question I have I is do you use any kind of binder? 3 out of my 4 burgers fell apart. So happy you enjoyed them. If we start to see a burger falling apart, we try to gently push it back together in the pan. If you want to try a binder, throw in an egg to the mixture. This should help keep them together. You can also try chilling the patties before cooking. Let me start this off by saying I don’t like mushrooms at all! I really hate them after chopping them into a million small pieces. LoL I gave this recipe a try tonight and I’m so impressed. The burgers are hearty and delish. I used oyster sauce because I didn’t have fish sauce. I also put a heavy coating of salt a pepper on the formed patty right before frying. I’m really impressed by how they turned a nice shade of brown. My typical turkey burger is a dull shade of gray. HaHa. Thanks for the recipe. I will be making these again. Made these turkey burgers for dinner tonight. Very easy and absolutely delicious. Will make them again and again. Hi, could I make these up and then freeze them, for future use???? Hi Caroline, You can freeze these uncooked and cooked. To freeze uncooked patties, prepare them as directed then individually wrap each patty. Freeze. To serve, thaw the burgers then cook as directed. To freeze cooked patties, prepare and cook them as directed then line up on a baking sheet. Slide the baking sheet into the freezer and freeze until partially frozen (about 30 minutes). Wrap them with plastic wrap (place a piece of wax paper if wrapping multiple patties together) then store in the freezer. To serve, reheat in the microwave or oven.